If your shoulder growth has stagnated, it’s time to try a different approach. Too many guys walk into the gym, grab the heaviest weights they can handle, and start swinging them around with reckless abandon. Sure, mechanical tension is an effective way to build muscle. And yes, heavier loads will generally make it easier to generate more tension. The caveat? You need to execute lifts properly with those heavy weights. Using your legs to generate momentum to perform a sloppy half-rep lateral raise with a 50-pound dumbbell does not qualify as maximizing tension. Neither does arching your back so much that while you can do seated shoulder presses with 100-pound dumbbells, you’re really just dumping all the stress into your chest. Still, the idea that lifting heavy and systematically increasing your loads over time (progressive overload) is hardly revolutionary. In fact, most guys lift this way by default. Mechanical tension is great, but muscles respond to more than just tension. Muscle development requires a multifaceted approach. 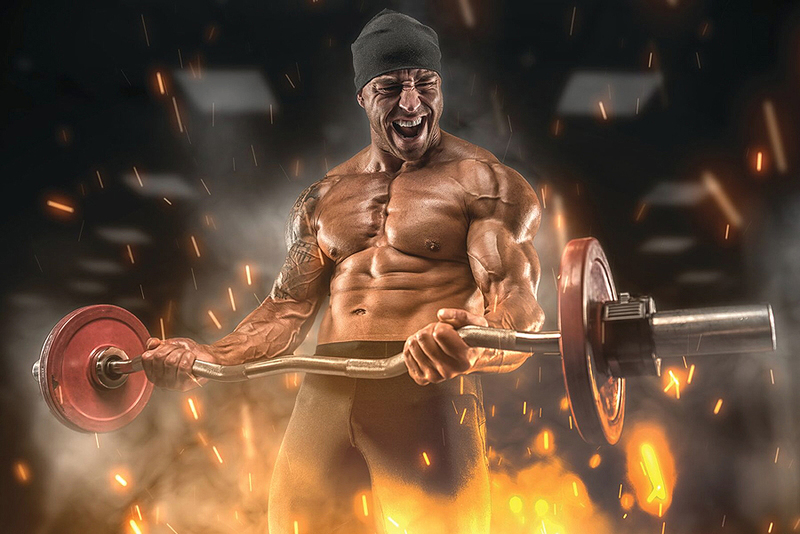 This high-volume shoulder workout focuses on an often-overlooked mechanism of muscle growth—discussed by hypertrophy expert Brad Schoenfeld in a 2013 study published in Sports Medicine—called metabolic stress. Metabolic stress occurs from a lack of oxygen supply to the muscles, persistent muscle contractions (think constant tension) that prevent blood from escaping, and the buildup of metabolic by-products such as lactate. In other words, to maximize metabolic stress, you want to chase the pump and burn, as those are the two main indicators of metabolic stress. So what’s the best way to induce a crazy pump and a wicked burn? In the following workout we use what’s known as a giant set to incorporate all three methods and maximize metabolic stress. A giant set is a group of four or more exercises that target the same muscle group. When these are executed properly, they feel as brutal as they sound. In addition to an overemphasis on heavy lifting, a lot of guys are leaving shoulder gains on the gym floor because they always train the same angles. The shoulder is a rotational joint and has many angles of movement. As such, three of these four exercises will challenge angles that you probably haven’t been working. Y-Press: Maintain a tight core and keep your shoulders right above your hips throughout the set. Avoid arching or leaning back. Hold a pair of dumbbells at shoulder height. Press up and out to form a “Y” at the top. Your forearms should be angled outward throughout the set. Supine Incline Dumbbell Front Raise: Lie faceup on a bench set to an approximate 30-degree angle. Start each rep with the dumbbells hovering just above your thighs, with your palms facing down. With straight arms, move them in an arc until they are almost directly above you. Finish the rep just before you reach the point where tension is lost. Prone Incline Dumbbell Lateral Raise: Lie facedown on a bench set to an approximate 30-degree angle. Start each rep with the dumbbells just outside your shoulders, hanging from straight arms. Bring the dumbbells up and to your sides in an arc-wise motion. At the top, finish the rep just before your shoulder blades start to retract so you don’t dump the tension into your traps. Military Press: As with the Y-press, tighten your core and avoid arching or leaning backward. While the path of the bar is up and down, you’ll maximize tension by focusing on the path of the elbows. Pull your elbows out during the eccentric and bring them in on the concentric. Perform four giant sets (16 total sets), taking the prescribed rest after each set. For tempo, the designated number refers to the eccentric portion of the lift. Perform a one-second concentric for all lifts, and do not pause at the top or bottom of the movements. Dumbbell Raises: Squeeze it, don’t swing it. Stop thinking about moving weight from point A to B. Focus on contracting the working muscle through the whole range of motion and against the resistance. An active range of motion is that which allows you to maintain tension on the working muscle throughout the entire set. Always work through the maximum active range, rather than simply trying to achieve the greatest range of motion. We’re using rep ranges on the higher end of the spectrum to ensure plenty of time under tension. If you aren’t able to complete the prescribed reps, utilize partial reps to finish the set. Work through whatever active range you can (even if that means one or two inches) in order to keep TUT high. The weight you use is irrelevant. We’re not looking to set PRs here. Focus on feeling the delts do all the work and contracting as hard as you can through the active range.